Markets for the group's products were favourable over the past financial year. The strength in our markets which was evident in the last quarter of 2017 continued into 2018. World crude steel production increased in the 2017 calendar year (CY17) by 5% over the 2016 calendar year (CY16), while stainless steel production increased by 6% over the same period. Prices for the group's products during this financial year were more stable than the previous year as synchronised economic growth around the world helped balance the commodity markets in which the group participates. 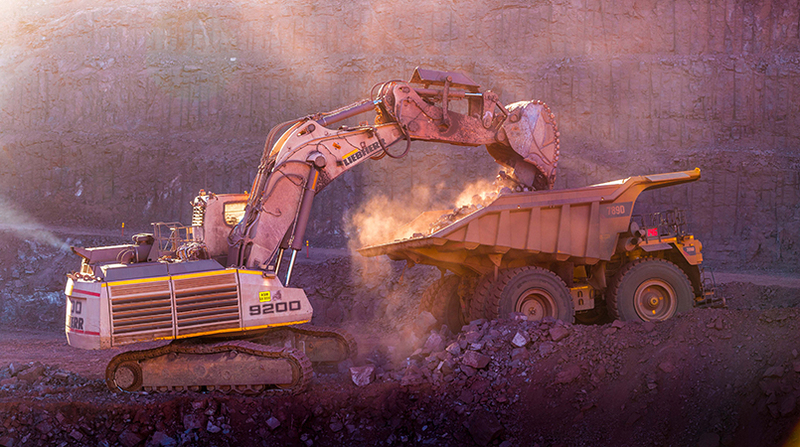 The group's major operations performed well, with record production volumes achieved for iron and chrome ores. The 2018 financial year (FY18) was the fourth consecutive year of increased production of these products. Production volumes for manganese ores increased by 21% to over 3,7 million tons from 3,1 million tons in FY17. These production achievements are especially pleasing in light of the improved safety performances in these operations, with Assmang improving its lost-time injury frequency rate (LTIFR) to 0,13 from 0,17 in FY17. Dwarsrivier recorded a slight improvement in its LTIFR to 0,19 in FY18, compared to 0,20 in FY17. 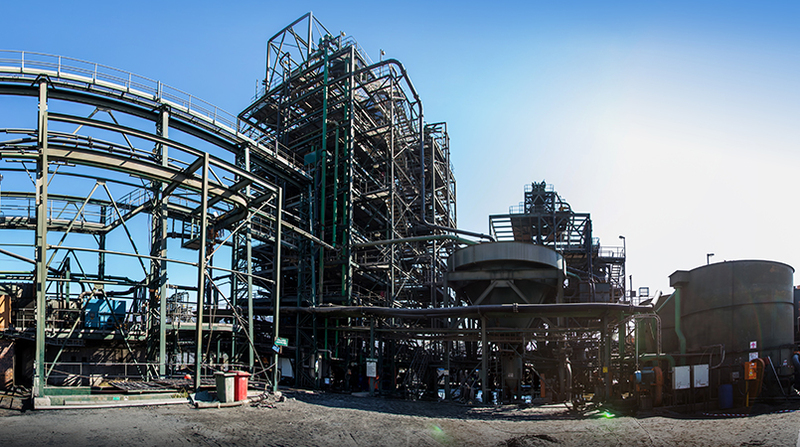 Assmang's smelting operation in Malaysia, Sakura Ferroalloys, achieved design production capacity for ferromanganese on both its furnaces. However, we are saddened to report the death of our colleague who, on 30 March 2018 sustained a fatal injury at the operation. We extend our deepest condolences to his family, friends and co-workers. The increase in world crude steel production in CY17 resulted in nearly 1,7 billion tons of crude steel being produced (CY16: 1,6 billion tons). 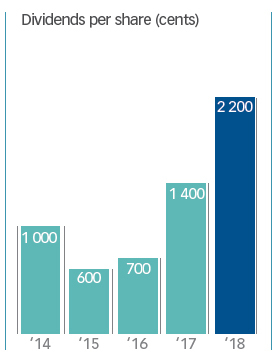 Stainless steel production growth outpaced the good growth in crude steel once again, reaching 48 million tons. This led to firm demand for the group's products. China produces approximately 50% of the world's crude steel and 53% of stainless steel. Crude steel capacity utilisation for CY17 stood at 72%, higher than 69% for CY16. Over the past three years, steel capacity utilisation in the United States (the USA) has increased steadily, to over 80% in September 2018. Tighter environmental controls imposed in China increased the demand for higher grade ores, which resulted in higher prices for high-grade products. As was evident towards the end of CY17, the premium for "lumpy" grades of iron ore increased, averaging 81% higher than the level recorded for FY17 at an average of US dollar 13,34 per ton. The average benchmark price for iron ore for FY18, at US dollar 69 per ton (62% iron content material, delivered in China) was similar to FY17, with a notable reduction in price volatility. Prices for manganese ore benefited as a result of increased demand from China, with the index price for high-grade material increasing by 19% in FY18 to an average of US dollar 6,88 per dry metric ton unit (dmtu), delivered in China (FY17: US dollar 5,77 per dmtu). The manganese alloy market was firm across the year. However, margins for producers were generally under pressure due to the higher prices for manganese ore. 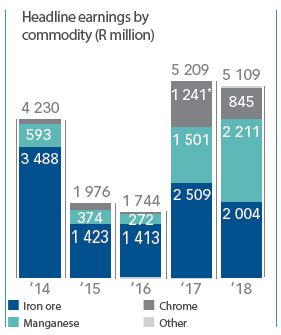 The increased level of production of stainless steel supported firm demand and more stable prices for chrome ore, with Dwarsrivier selling almost 1,6 million tons of ore. This was 22% more than the volume sold in FY17 and another sales volume record. As was the case with the group's other products, prices for chrome ore, although on average lower than FY17, traded in a tighter range. However, the average benchmark price (US dollar 224 per ton) for 44% chrome concentrate material, delivered in China, for FY18 was 28% lower than FY17 (US dollar 310 per ton). Assmang's Black Rock Expansion Project has reached the stage of 90% completion with R6,0 billion having been spent to date. The remainder of the capital expenditure (R700 million) is expected to be spent over the next 30 months. 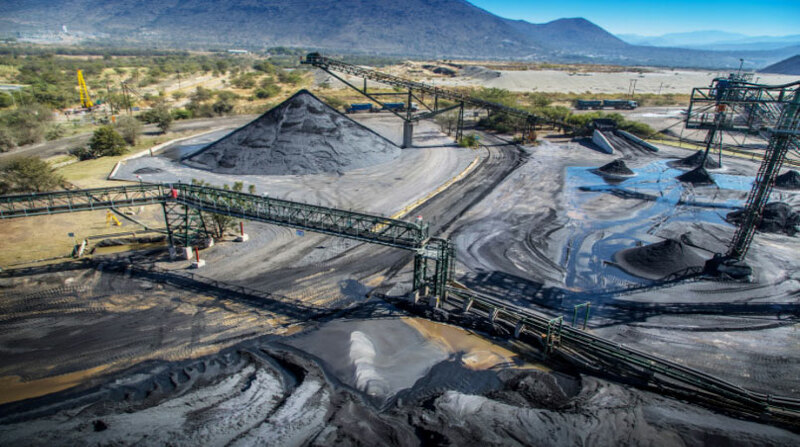 A further R2,7 billion has been approved to modernise the Gloria mine. 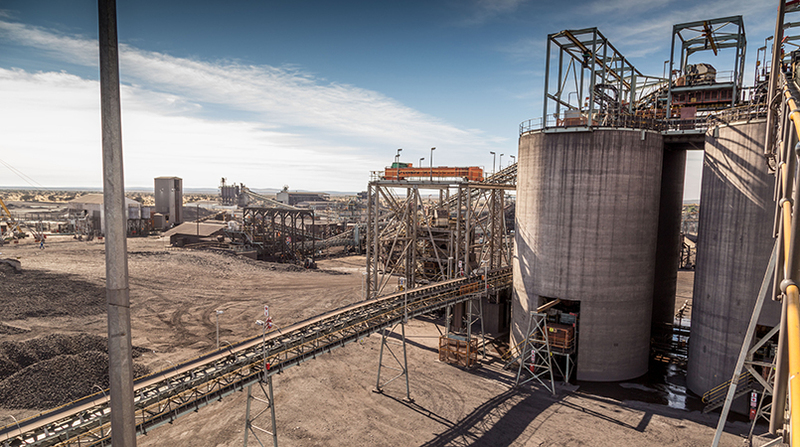 This investment aims to provide improved balance in Black Rock's resource, production and marketing capabilities, while increasing the overall production capacity of manganese ore from the Black rock complex to five million tons per annum. With the group's mines either in steady state production, or expanding, its cash generation remains very positive given the market conditions described above. 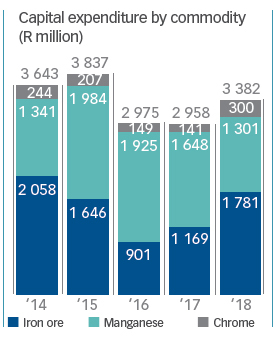 The net cash position of the group increased over FY18 by R2,8 billion to R7,9 billion at year-end, enabling the board to approve a final dividend of R12 per share, making the total dividend for FY18 a record, at R22 per share. The economies of the developed world continue to improve, and combined with ongoing infrastructure expenditure in China, are providing a firm underpin for commodity demand and prices. The drive by Chinese authorities to reduce the environmental impact of its steel producers has provided further support for the group's higher grade products. Of concern for the chrome industry is the recent "trade wars" between the USA and China, which are impacting the export of stainless steel by China negatively. Regulatory uncertainty remains a feature of conducting business, and especially mining in South Africa. Recent changes contained in the newly gazetted Mining Charter have had a limited impact on reducing uncertainty. 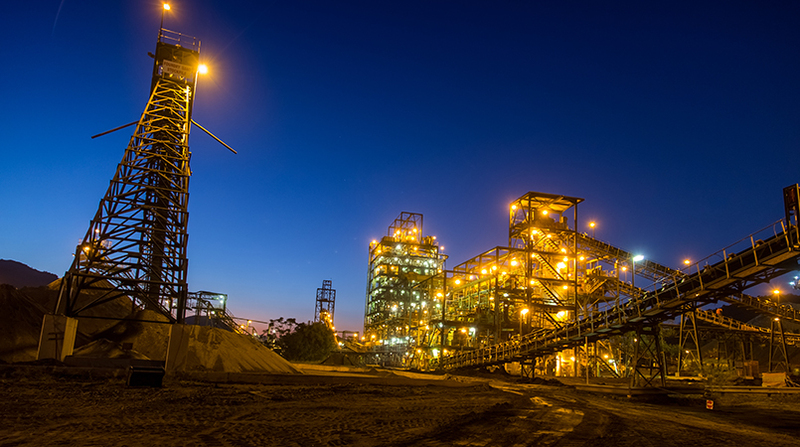 This regulatory uncertainty, combined with continued increases in electricity prices has severely constrained the relative attractiveness of South Africa as a mining and manufacturing destination. The short-term gains arising from the recent decrease in the level of the rand to the US dollar, while immediately positive for the group, are however, expected to manifest themselves in higher costs in the medium to longer term. This past year has been another very successful year for the group. Achieving record levels of production, sales and earnings, no matter the circumstances, is not easily achieved and I wish to commend the management team and all of our staff who have contributed to this success. In addition, such success cannot be achieved without partnering with dedicated joint-venture partners, agents and advisers. Likewise, I extend my thanks to them for their respective contributions during the year. With the aim of expanding the group's operations in a careful and considered manner, we welcome Kieran Daly as executive: growth and strategic development and Bongani Phakathi as executive: human resources and public affairs to the group's executive team on 1 May and 1 October respectively. Ross Davies, appointed as chief financial officer in 2017, was appointed to the board in February this year. I wish them all everything of the best in their respective roles in the group.